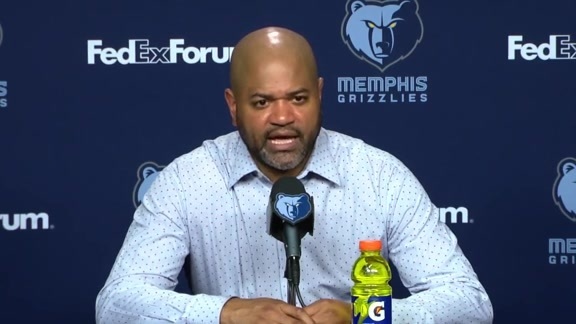 Listen to what Head Coach J.B. Bickerstaff had to say following the Grizzlies match against the Mavericks on Sunday night. 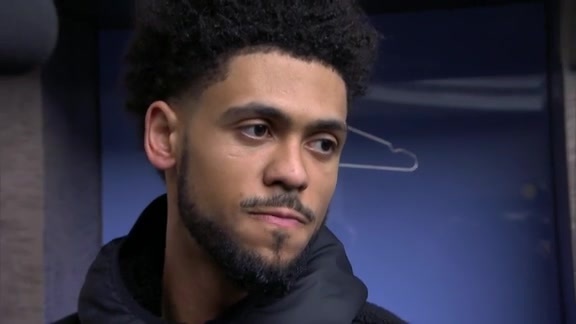 Tyler Dorsey speaks to the media after tonight’s game against the Mavericks in Memphis. Grizzlies guard-forward Justin Holiday talks with reporters following Sunday’s matchup against the Mavericks. Watch the key moments of Sunday night’s game at FedExForum. 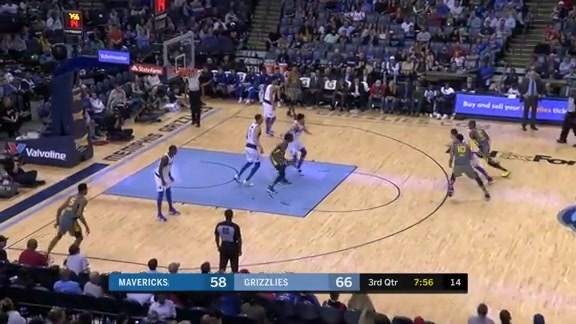 Delon Wright records a triple-double for the Grizzlies of 20 points, 13 rebounds and 12 assists in the game against the Mavericks. 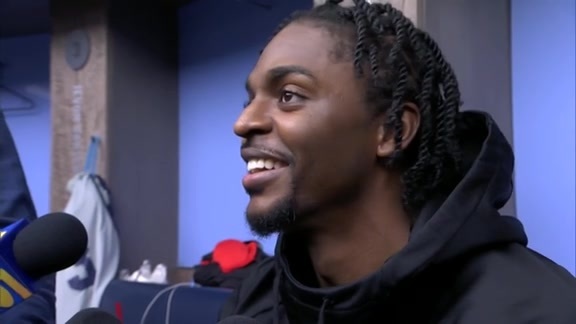 Justin Holiday scores a team-high 30 points Sunday night against the Mavericks. Jevon Carter fires a deep three from beyond downtown. Delon Wright drops a half-court dime to Justin Holiday for the jam! 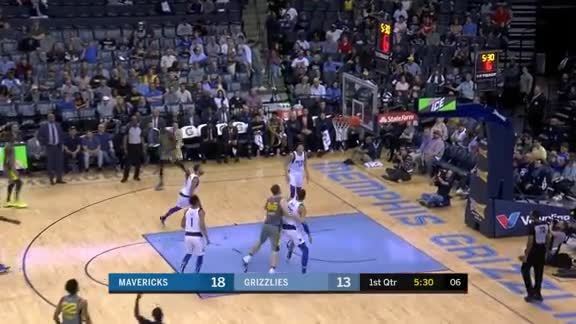 Chandler Parsons takes it coast-to-coast for the fast break finish. Dallas got 84 points from its bench, which set the Grizzlies’ opponent franchise record (previous: 71 points, twice, most recently on Feb. 28, 2002 at Utah). The Mavericks opened up overtime with a 7-0 run over the first 1:51 to go up 119-112. Memphis responded with a 7-0 run of their own, but Dallas scored the next five to take the lead for good. Despite setting a franchise record for three-pointers made, the Memphis Grizzlies fell to the Dallas Mavericks, 129-127, in overtime on Sunday evening in FedExForum. The Grizzlies dropped to 32-48 on the season and 20-20 at home. The Mavericks improved to 32-48 on the year and are now 9-31 on the road. Memphis takes the season series 3-1, marking the first time they’ve won a regular-season series against Dallas since 2014-15 (also 3-1). Memphis made a franchise-record 19-of-44 (.432) three-pointers in the game, surpassing the previous high of 17 three-pointers (Dec. 31, 2016 at Sacramento). Dallas meanwhile made 12-of-41 (.293) triples in the game. In overtime, Dallas kicked off the period with a 7-0 run to go up 119-112. Memphis countered with a 7-0 run of their own from 2:36 to 1:26 (:50 span) to knot things back up at 121 apiece. Things looked bleak for the Grizzlies after missing threes on back-to-back possessions, but Justin Holiday canned a triple with 20 seconds left that trimmed the Mavericks’ lead to 126-124 to keep the game alive. 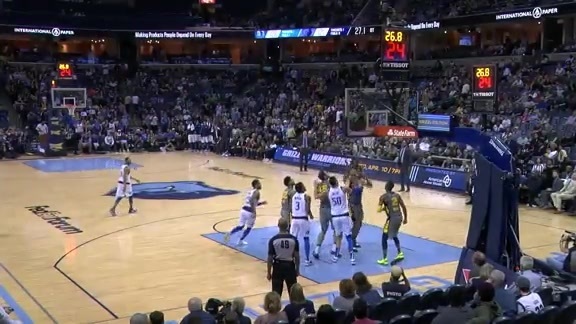 With the shot clock off, Memphis had to foul Trey Burke, who made both free throws to make it a two-possession game with 15 seconds remaining. Holiday proceeded to nail an off-balance three with 13 seconds left, bringing the Grizzlies within one at 128-127. 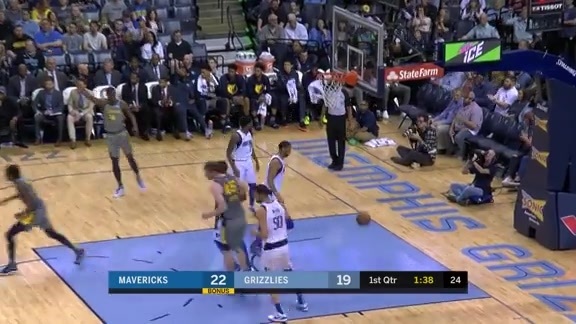 Burke went to the line again, making the first but missing the second, giving the Grizzlies a chance to win or tie. With a foul to give, Dallas used it as a makeshift timeout with 4.5 seconds left. Delon Wright got the ball on the inbound set and used a stepback to get off a clean 26-foot shot at the buzzer, but it fell short, ending the game. Fresh off his first career triple-double, Wright followed up with another triple-double by finishing with 20 points, 13 rebounds and 12 assists. Wright becomes the first Grizzlies player ever to record back-to-back triple-doubles, and joins Marc and Pau Gasol as the only players to have multiple triple-doubles in a Memphis uniform. Holiday led all scorers with a career-high 30 points (6-11 3P) and grabbed five boards. Holiday led the Grizzlies in scoring for the first time this season, which makes him the 19th different Memphis player to lead the team and expands the NBA record. Prior to this season, the New York Knicks had 16 different players lead them in scoring during the 2014-15 season. Bruno Caboclo recorded his third double-double of the year, finishing with 13 points and a career-high 17 rebounds. All three of Caboclo’s double-doubles have occurred within the last two weeks. Tyler Dorsey added 15 points (5-11 3P). Dorsey is averaging 14.5 points over his last nine games. Tyler Zeller also scored 15 points and grabbed five boards. Zeller’s 15 points was the most since April 1, 2018 (at Denver), and he has now scored in double figures in both of his games with Memphis since signing back on April 5. Ivan Rabb chipped in with 14 points. Rabb has reached double-digits in three-straight games, matching a season-high streak. The Grizzlies had eight players score in double figures, marking the most Grizzlies to score at least 10 points in a game this season and tying a single-game franchise record. While the Grizzlies were better from beyond the arc, the Mavericks outshot them overall by going 45-for-98 (.459) from the floor compared to Memphis making 42-of-98 (.429). With their 19 three-pointers in the game, the Grizzlies set a new franchise single-season record for threes made in a season, surpassing the previous record of 767 (set in 2016-17). Memphis has now made a total of 780 threes with two games left in the season. Burke led Dallas with 24 points off the bench while passing out five assists. Fellow reserve Salah Mejri scored a career-high 19 points and grabbed nine boards. Dorian Finney-Smith notched his second double-double of the season, finishing with 16 points and 12 rebounds. Rookie Jalen Brunson recorded the second double-double of his career, finishing with 12 points and a career-best 10 assists. Justin Jackson also scored 16 points (6-9 FG). Dwight Powell added 15 points. while Daryl Macon had 12 points and seven boards. Memphis led for the entire third quarter, but the fourth was a different story. A Mejri three-pointer with 7:19 left in the game put the Mavericks up 95-94, giving them their first lead of the second half. Trailing 101-97 with 4:15 remaining, Caboclo hit a three from the wing – his third of the day – to bring Memphis within one. Soon after, Holiday hit a three of his own at the 2:50 mark to put Memphis back on top 105-103. 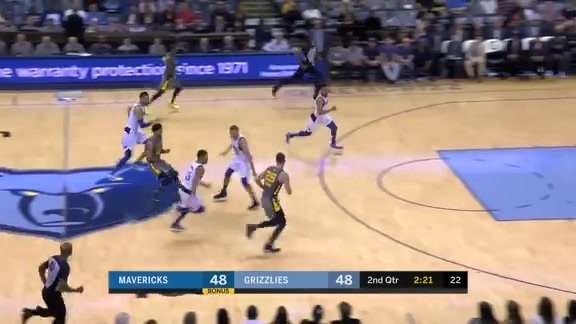 With the Grizzlies up 112-110 and 12 seconds remaining in regulation, the Mavericks missed four shots and corralled them all, with Mejri finally tipping in a putback with just 1.5 ticks left to tie the game and force overtime. Both teams made exactly 19 field goals in the first half, including the Grizzlies going 8-for-19 (.421) from three-point range while the Mavericks were 4-for-17 (.235) from deep. Memphis crashed the boards well in the first half, outrebounding Dallas 27-19 (+8) and outgained them 7-0 in second chance points. Wright rolled in a Euro step layup with 0.9 seconds left to put Memphis up 56-52 at halftime. 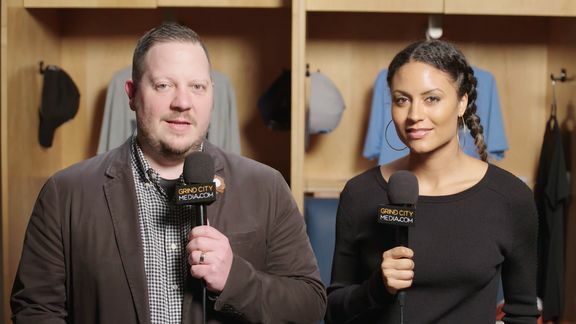 The Grizzlies will play their last road game of the season when they face the Detroit Pistons on Tuesday, April 9 at 6 p.m. CT inside Little Caesars Arena. Tune in to FOX Sports Southeast presented by Pinnacle Financial Partners or listen on 92.9 FM ESPN to follow the action. Yeah. Obviously there were some plays that led up to that moment, but we just couldn’t secure that rebound. You secure that rebound, obviously the outcome is probably different. There were some mistakes made in other places that, if we correct those mistakes, we never put ourselves in that situation. But give our guys credit, being down and then being able to battle back, give themselves an opportunity to win the game. They continued to scrap. Guys made plays when they needed to; Justin made some huge shots down the stretch. We just couldn’t get the one stop we needed. I mean he’s been working at it. He’s had some really good nights for us since he’s been here, having to carry the load with Mike (Conley Jr.) being out, knowing you are going to get more minutes given the opportunity and freedom to make plays, and understanding what a point guard does. His responsibility is to make his teammates better, and he’s playing that way. He’s finding them when they are open, he’s creating and getting into the paint, putting a ton of pressure on the defense. I think we are seeing flashes of what he is capable of. I mean, he’s changed the game. You look at all the seven-footers we have in our game now, with the face up skill set and the ability to shoot the three… A ton of that is because of his influence, you go back to Dirk seven or eight years ago, a lot of the big guys now were in an influential period of their lives and game development. They watched him play and added those things to their game. They weren’t just back-to-the-basket bigs. You look across the league at all the centers now and how many of them can play behind the three-point line, can play with a skill set to handle the ball, be able to face you up, be able to drive it and make midrange shots. So I think he’s changed the game and a lot of the bigs we have are a reflection of that. He’s a great dude, great coach. In my little time of getting coached by him and getting to know him, he’s just a great dude, great coach and I’m happy for him. Congrats to him for getting that head coaching job. It’s a whole new world for him, but I think he’s going to excel there. Bring that intensity every game and every day, especially in practice on the defensive end because he’s going to bring that mentality every day in every practice. He’s one of the best power forwards with his legendary fade away with the kick up. Just watching him growing up, he’s one of the legends I think. To play against him and compete against him is great. He’s still got it as you can see – still hitting threes, still hitting shots, so just competing against anyone like that is great to have as part of my career. It was very tough. The ball just didn’t bounce our way. We could’ve come up on the rebound in regulation, but they ended up getting it and sending it into overtime. They started off hot, then we made a run and they made a couple tough shots at the end. We just couldn’t capitalize and finish it off, but I think we played hard overall, we just couldn’t get the win. The ball just went in today. I’m just trying to be aggressive and obviously help the team. Delon (Wright) has been doing a great job of getting the ball around. Just trying to finish the job that he’s been doing. If I had made the three before that point when the ball was bouncing around it wouldn’t have mattered. It’s the way this game is. We still had a chance after regulation. We wanted to win this game. It’s tough that we didn’t. A lot, especially his jump shot. Like I said last time we played them, Dirk [Nowitzki] is a legend. The fact that he’s still out there playing right now shows the level of competitiveness and the level that he is at to still be doing this now and being able to make shots, using his brain more than his body to help his team. Dirk has been great for this league, been great for the European players – being a big, big inspiration and motivation for those guys, as well as us here. Obviously, the way he shoots the ball is something I’ve looked at for a long time. Fresh off his first career triple-double, Delon Wright followed up with another triple-double by finishing with 20 points, a career-tying 13 rebounds, and 12 assists. Wright becomes the first Grizzlies player ever to record back-to-back triple-doubles, and joins Marc (five) and Pau Gasol (two) as the only players to have multiple triple-doubles in a Memphis uniform. Justin Holiday led all scorers with a career-high 30 points (6-11 3P) and grabbed five boards. Holiday led the Grizzlies in scoring for the first time this season, which makes him the 19th different Memphis player to lead the team and expands the NBA record. Prior to this season, the New York Knicks had 16 different players lead them in scoring during the 2014-15 season. Bruno Caboclo recorded his third double-double of the year, finishing with 13 points and a career-high 17 rebounds. All three of Caboclo’s double-doubles have occurred within the last two weeks (March 25 and 27). Tyler Dorsey added 15 points (5-11 3P). Dorsey is averaging 14.5 points over his last nine games. Tyler Zeller also scored 15 points and grabbed five boards. Zeller’s 15 points was the most since April 1, 2018, and he has now scored in double figures in both of his games with Memphis since signing on April 5. Ivan Rabb chipped in with 14 points. Rabb has reached double-digits in three-straight games, matching a season-high streak.